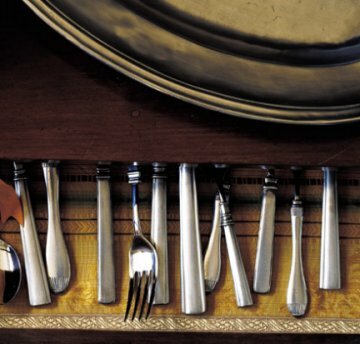 Pewter flatware from Match Pewter features hand-made pewter forks, forged blade knives, spoons and serving utensils. Each pattern is versatile and will look elegant in any modern or traditional design scheme. The pewter alloy is the highest-quality pewter in the market and is always lead-free, food safe and approved by the FDA. Each pewter flatware piece is polished and durable--the handles are made of high quality pewter that contains no less than 95% tin and the food eating ends are made of high-quality polished 18/10 stainless steel. All Match Pewter table knives are forged for durability--a trait rarely seen in flatware knife construction. Dishwasher safe using low heat setting and liquid dish washing soap. Made in Italy. You will not find a better quality pewter flatware in the marketplace today. We do not discount Match Pewter, but we do offer the lowest prices on Match Pewter that are allowed by the manufacturer. Rest assured when you buy Match Pewter flatware at Distinctive Decor, you are buying the best pewter flatware that you can purchase. Free shipping on Match Pewter is available year-round.